Hema Ravi has verses published in Metverse Muse, Efflorescence, Amaravati Poetic Prism, Symphony of Peace, Women, Wit and Wisdom among others. 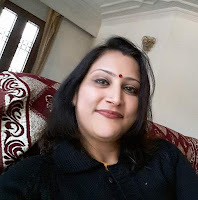 Her Haiku, tanka and verses have been featured in online and print journals; her write ups have won prizes in the Femina, Khaleej Times(Dubai) and International Indian (Dubai). She has published in the Hindu’s Voice your Views and Open Page. She is the author of Everyday English, Write Right Handwriting Series 1, 2, 3, co-author of Sing Along Indian Rhymes and Everyday Hindi. As an IELTS and Communicative English trainer, she empowers youngsters to their fullest potential. rubs into the psyche securely. the distressed, deprived and the deserving..
By giving back, feel light hearted. elevates into a higher being. With all humility await that grace. You’ve walked past swamps and forests to hills bare. Past lush green fields and early morning dews. The river of grace is ever flowing. halts earning of a few pennies. day after day new challenges pose. even as inflation’s at a zoom.